AKIPRESS.COM - President of Mongolia Khaltmaagiin Battulga received Prime Minister of South Korea Lee Nak-yeon in Ulaanbaatar on March 26. 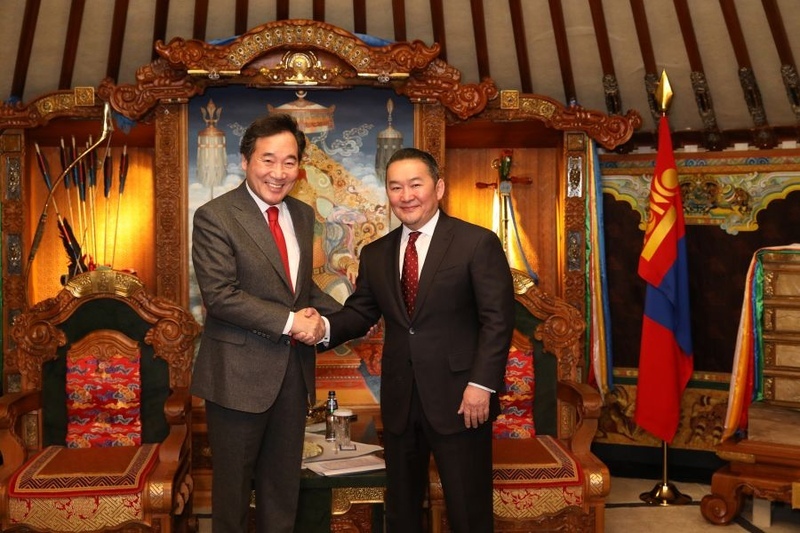 President Battulga welcomed Prime Minister Lee Nak-yeon to Mongolia and expressed his pleasure at meeting the latter again since their previous meeting during the Eastern Economic Forum in Vladivostok, Russia, Montsame news agency reported. Prime Minister Lee Nak-yeon conveyed the cordial greetings of President Moon Jae-in to President Battulga. 2020 will mark the 30th anniversary of diplomatic relations between Mongolia and South Korea. President Battulga suggested that the anniversary celebration should be a high level and productive event, while making a tangible proposal to establish a business council for young people of the two countries. Battulga expressed his support to the East Asian Railway Community Initiative, proposed by Korean President Moon Jae-in, and remarked that the initiative held practical importance to regional infrastructure and Mongolia, a landlocked country. Referring to his proposal to launch a joint working group on the 'Northeast Asian Super Grid' Project, which he made during the 4th Eastern Economic Forum in Vladivostok, Russia last year, President Battulga briefly told about the project and a relevant study on Mongolia’s potential to help reduce loads during peak hours in the ROK and Japan with its cost-efficient energy production from solar, wind, and coal sources. President Battulga highlighted the importance of such regional cooperation platforms in maintaining peace and strengthening trust in the region. Prime Minister Lee Nak-yeon expressed his readiness to work diligently towards upgrading the level of bilateral cooperation from comprehensive partnership to strategic partnership on the occasion of the 30th anniversary of diplomatic relations and spoke about the number of events that were being planned in scope of the anniversary. In particular, Prime Minister Lee Nak-yeon assured President Battulga that the above-mentioned projects, as well as aviation matters would be discussed in depth and asked the latter to pay close attention to these matters as well. The Prime Minister also expressed his support towards the President’s proposal to establish a business council for young people, while communicating his readiness to pay attention to its implementation through the corresponding institutions. During the meeting, President Battulga also brought to attention the Korean visa issues. Mongolian citizens who travel to South Korea for a short period and come back face difficulties in reapplication for visa. President Battulga asked Prime Minister Lee Nak-yeon to pay close attention to the matter of issuing visa to citizens who didn’t violate visa terms. At the end of the meeting, President Battulga wished success to Prime Minister Lee Nak-yeon’s official visit to Mongolia and conveyed greetings to his counterpart.